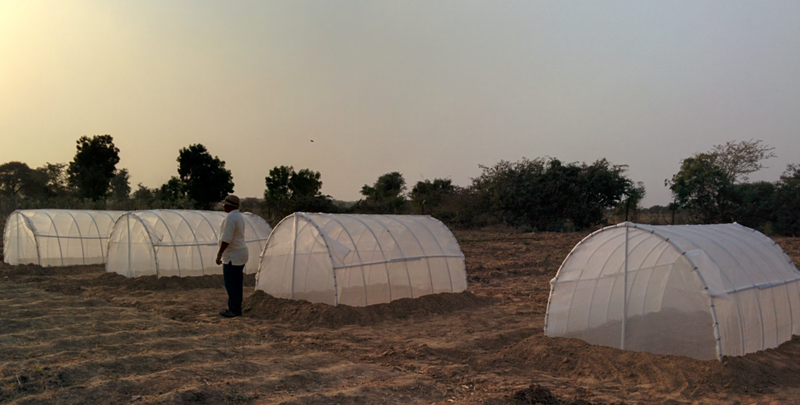 Net houses with sweetpotatoes pre-basic seed. Nigeria is among the top producers worldwide of staple crops lncluding cassava, yam, and sweetpotato (SP). Unfortunately, it has done little to curb malnutrition and poverty rates in the country. Regardless of its production of the aforementioned crops, Nigeria continues to rank high in the list of countries suffering from food shortages, food insecurity, and poverty. Nigeria has one of the highest rates of malnutrition in the world with over 300,000 children dying every year from acute malnutrition and over 10 million stunted children. The percent of children in Nigeria who are too thin for their height, or wasted, increased from 11% in 2003 - 18% in 2013. This is significantly higher than the critical threshold for declaring emergencies (15%). The prevalence of vitamin A deficiency effects 29.5% of the population, with the World Health Organization listing Nigeria as a “category one” country, the worst rating. Conditions are even worse in Northern Nigerian states. In Kano the prevalence of stunted growth for children under five years of age is as high as 48%. High levels of malnutrition lead to increased child mortality, and significantly reduce learning and economic capacity, effectively stagnating economic development. Enter, the sweetpotato. The sweetpotato is an important root crop in Nigeria. Nigeria is the second largest producer of the crop in Sub Saharan Africa. It has the ability to thrive in marginal soil, while its broad agro-ecological adaptability makes it a food security crop because it can be grown in all of Nigeria’s 36 states. It has a relatively short production cycle (3-4 months) and its roots and vines can be utilized for both human and animal consumption. 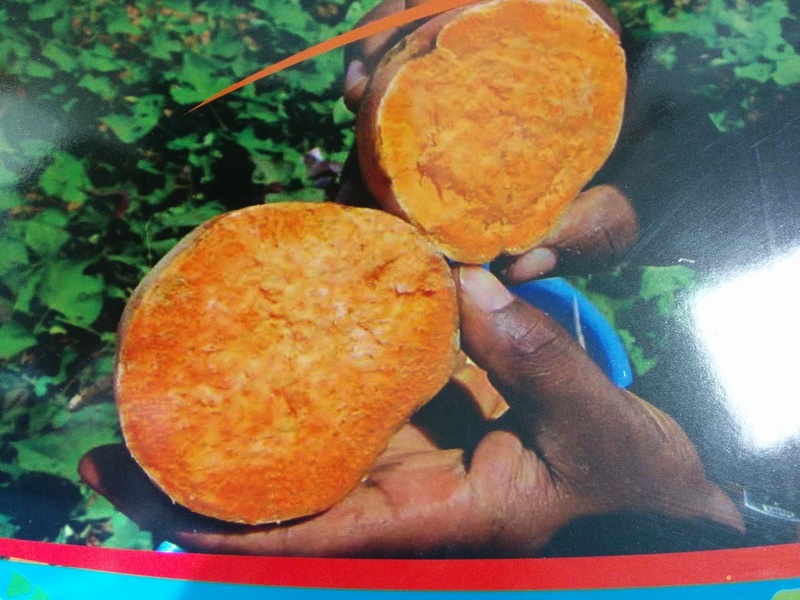 The orange-fleshed sweetpotato (OFSP) is developed and bio-fortified with vitamin A by the International Potato Center (CIP) and the National Root Crops Research Institute (NRCRI). The best thing about OFSP? It only takes 125 grams of OFSP to supply the recommended daily allowance of vitamin A for children and non-lactating women. The NRCRI is helping smallholder farmers and targeted beneficiaries, specifically women and children, to fight vitamin A deficiency in Nigeria and Sub Saharan Africa. The CIP is also working in collaboration with eHealth Africa (eHA) to jointly set up the OFSP quality declared planting materials at centrally located multiplication plots/net houses in Bayero University Kano. Through technology and research, eHA and our partners look forward to seeing how the OFSP combats malnutrition and improves the overall well-being of the Nigerian people. Stephanie Okpere in Sweetpotato field during the ToT Training, ARMTI, Ilorin. The International Training of Trainers (ToT) on "Everything You Ever Wanted to Know about Sweetpotato" was held in Ilorin, Kwara State, from October 5 -16. It was a 10-day intensive program, organized by the Agricultural and Rural Management Training Institute (ARMTI), the Federal Ministry of Agriculture and Rural Development, and the Government of Nigeria. eHealth Africa (eHA) was represented by Stephanie Okpere, Project Coordinator from the Nigeria office. Stephanie’s training was sponsored by the International Potato Center (CIP). ToT was organized as part of ARMTI's goal to train "extension personnel" on the latest developments in Sweetpotato production and utilization across Africa. ARMTI in the last three years has jointly organized this course with the CIP, and Helen Keller International’s and Reaching Agents of Change project. The ToT course aims at increasing investments in the Orange-Fleshed Sweetpotato (OFSP) to combat vitamin A deficiency among children and women of reproductive age. Stephanie Okpere conducting step-down training in Kano. ARMTI also seeks to build the capacity of public sector extension and NGO personnel to effectively implement initiatives aimed at promoting the dissemination and appropriate use of Vitamin A-rich OFSP in the value chain. Dr. Sarma Mallubhotla addressing the trainees in eHA. Click here to read about the use of the Orange-Fleshed Sweetpotato to fight malnutrition in Africa. From September 29-October 1, eHealth Africa was invited to participate in the 6th Annual Technical Meetings for the Sweetpotato for Profit and Health Initiative (SPHI) held in Kigali, Rwanda. eHA was represented by Dr. Sarma Mallubhotla, Program Manager for Health, Nutrition and Agriculture. 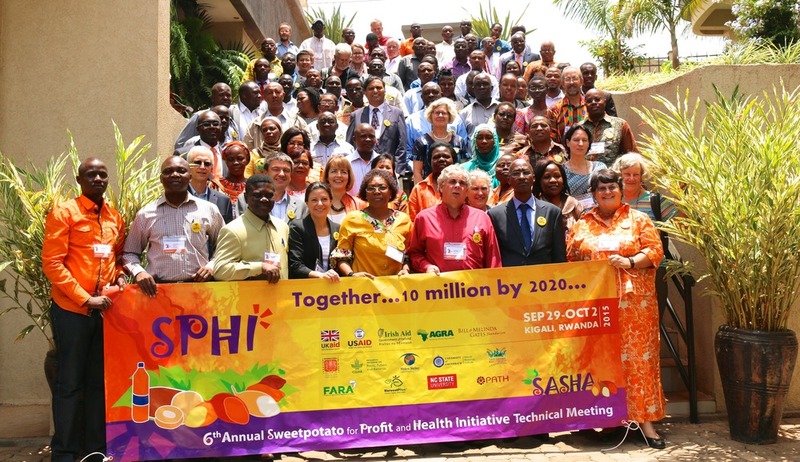 Launched in October 2009, SPHI is a 10-year, multi-donor effort that seeks to reduce child malnutrition and improve smallholder incomes through the effective production and expanded use of orange-fleshed sweetpotatoes (OFSPs) in sub-Saharan Africa. By 2020, the initiative aims to improve the lives of 10 million African households, achieving an annual value of $241 million in additional production in 17 African countries. Malnutrition contributes to half of all deaths of children under five. When children don’t have the right nutrients in their diets, such as vitamin A or zinc, they struggle to fight off common diseases like diarrhea and pneumonia. Poor nutrition has lifelong consequences for physical and mental health. According to the Forum for Agricultural Research in Africa (FARA), the role of agriculture in Africa’s development is enormous. The meetings began with an opening address by the Minister of Agriculture and Animal Resources, Honorable Geraldine Mukesimana, Republic of Rwanda. A major goal of this meeting was to have representative participation by scientists and practitioners throughout Sub Saharan Africa (SSA), as well as international academic institutes, NGOs and donors. The meetings drew more than 100 participants from 14 countries. Recently CIP and eHA signed a collaborative agreement to work on agriculture & food-based “OFSP projects” in the SSA region. Achieving food and nutrition security is an essential tool for fighting poverty. Biofortified crops such as OFSP with better agronomy can lead to better nutrition and sustainable livelihoods. Dr. Mallubhotla with Dr. Barbara Wells, Director General-CIP, and Dr. Ted Carey, Senior Scientist & Regional Sweetpotato Breeder (Ghana Sweetpotato Support Platform). From the CIP Ghana sweetpotato support platform, Dr. Ted Carey & Dr. Erna Abidin presented their team’s research for development work: “Jumpstarting OFSP In West Africa Through Diversified Markets.” Their project highlighted sustainable and inclusive market-driven approaches for OFSP to increase smallholder incomes and improve health through consumption of Vitamin A rich OFSP, and to reach millions of households, especially women and children in Ghana, Nigeria and Burkina Faso. 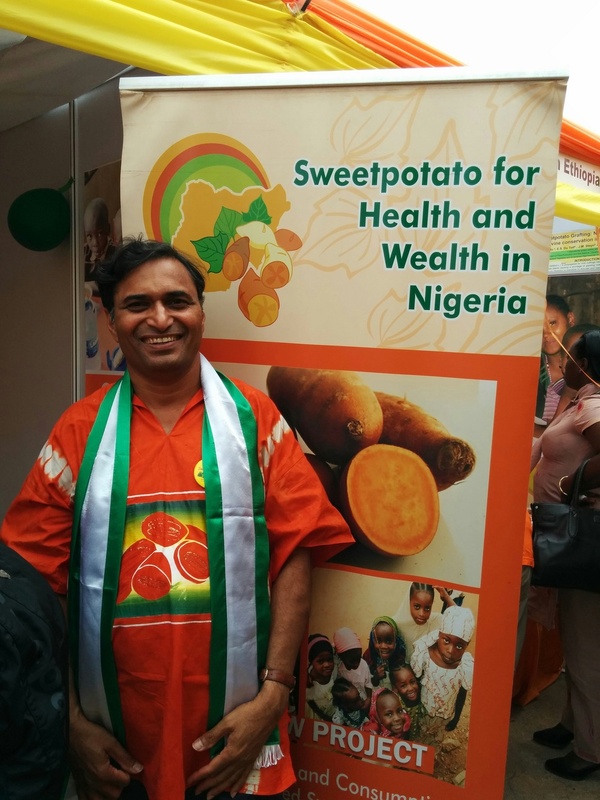 CIP & eHA are working together to enhance food availability and income generation through expanded production and diversified use of nutritious Orange-Fleshed Sweetpotatoes, with a geographical focus on Nigeria and other West African countries. Together, we continue to develop and test technologies and delivery mechanisms that are capable of fulfilling these goals.